The Fellowship was fortunate enough to obtain a copy of RED CITY #1 from Image Comics. Daniel Corey writes, Mark Dos Santos draws, and Chris Fenoglio colors. Cal is a security officer in a futuristic version of our solar system where all of the planets are inhabited. He’s being given a last-chance assignment (he’s creative, and not happy with his pay grade) to find a missing VIP in his old stomping grounds, Mars Central, AKA the Red City. He heads straight for his old underworld connections, and soon finds more trouble than he wanted. Cal is a smooth talker (based mostly on his narration) who people still don’t seem to like much. He’s an interesting character, though, and he’s a catalyst, so the story moves pretty quickly. The book also has some great setting concepts, with some of the aliens almost stealing the show. The story is gritty, as are some of the background settings, and overall it comes together into a nice sci-fi adventure. I’m looking forward to seeing more of this setting, and meeting more interesting characters. I wonder how dark they’ll go with it; it should be fun finding out. 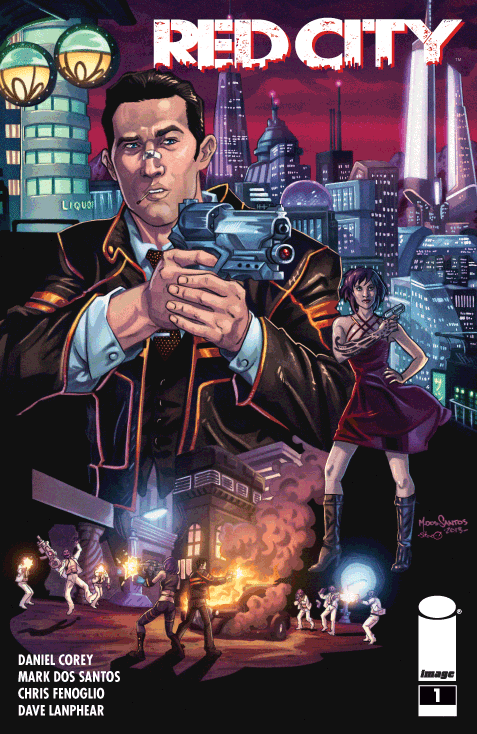 RED CITY #1 is available now at your FLCS or at imagecomics.com.